I got caught up watching the F8 Keynote speech this morning on Mashable. Which is unusual in its self because I'm not that much of a Facebook user but with the introduction of Google+ I was interested to see if Facebook would do anything that would leap it far ahead of its new rival. With Timeline I think they've delivered something special. See the short video below. Before I continue, just a quick comment on the F8 speech, which went for 1 hour and 40 minutes. The opening joke by SNL's Andy Samberg impersonating CEO Mark Zuckerberg, whilst funny to begin with, kind of stretched into something weird to the point where I was just glad to see him get off the stage. I was definitely with Mark when he jokingly said "Don't start doing impressions". The rest of the keynote was delivered in Mark's somewhat awkward but still very listenable style. I felt he really did explain the changes well. The highlight for me though was when Chris Cox, FB Vice President of Product Management, came onto the stage and explained the inspiration behind Timeline. A fascinating story in its self. I'd recommend you watch the keynote speech just for that - which starts at about 1 hour and 24 minutes in. Back to Timeline and my thoughts. In a nutshell, to me, Timeline is like the Super Profile page you've been waiting for. It's the scrapbook of your life. It doesn't just record your activity on Facebook as it happens, it also allows you to add to it retrospectively. For example, if you have a photo of you as a very young child, you can add it into your timeline so it appears chronologically in the year it was taken. That ability to me is important enough on its own. In many ways your Facebook profile could become the ebook of your life. Imagine using your Timeline as a basis for a book to preserve your family history. I'm sure print on demand publishers like Blurb will see an opportunity here. Pick a year from your timeline and turn it into a gift book for family. How about all those videos you've uploaded or the music you've shared. Create a DVD of a year or two in your life, complete with the music you liked that year, perhaps? There's certainly a lot of potential for how Timelines can be used and why you'd want to spend time curating yours. It's the kind of profile page that you won't just fill out and occasionally update - if you remember. It's something you'll probably visit just to see how it looks... and it does look good. I have to hand it to the designers and programmers of Timeline. It really is something you want to look at just to see if the automatic algorithms are really picking out the highlights or whether you need to tweak things a bit. I'm sure when Timeline is finally rolled out to everyone on Facebook there will be the usual backlash of people who liked the old Facebook. They've already started with the recent introduction of the new look news feeds and live ticker. Both of which I like a lot - especially the live ticker. In the big scheme of things the complainers will settle down because Facebook, wisely (or arrogantly depending on your point of view), usually sticks to its guns when it introduces change. Quite frankly I want to see Timeline succeed... and maybe Google+ will then look at its self and do something complimentary rather than competitively. I haven't even gone into all the ways the new look Facebook will help you discover all kinds of things from your friends as they discover them. It's probably better if you watch the keynote speech for that. 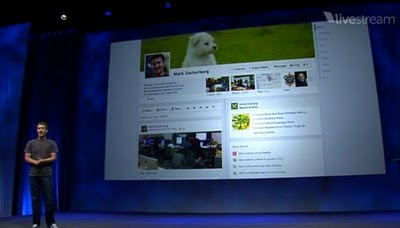 All I'm saying is, for the first time, I'm looking forward to using Facebook... and that's a paradigm shift for me.